A social worker fired after Victoria Climbie's child abuse murder has fought off a High Court challenge to stop her working with children. 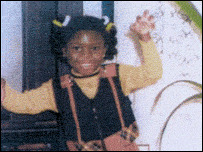 Angella Mairs was sacked for gross misconduct by north London's Haringey Council after the eight-year-old's death in 2000. Ms Mairs was banned from working with children but won an appeal in 2004. Lawyers for the education secretary launched the legal action last week in an attempt to overturn the ruling. Victoria died with 128 scars on her body. Her great-aunt Marie Therese Kouao and her boyfriend Carl Manning were jailed for life in January 2001 for her murder. Ms Mairs was the manager and supervisor of social worker Lisa Arthurworrey, also sacked for gross misconduct after the death. Her name was then put on the list of people considered "unsuitable" to work with children. But she won an appeal before the Care Standards Tribunal, which directed that her name be removed from the list and the ban lifted. Philip Coppel, appearing for the education secretary, argued the tribunal in 2004 had failed to make clear findings on critical issues and was at odds with findings of the Laming public inquiry into Victoria's death. On Wednesday, Mr Justice Leveson ruled the tribunal had been entitled to reach its conclusion and dismissed the challenge.